KPLU’s new School Of Jazz CD – Volume 9 will be released this coming Tuesday, May 7. Listeners can purchase the CD at kplu.org. All proceeds go to the schools’ music programs. KPLU has raised over $70,000 for the schools, since the project started. This year, bands from Ballard High School (Seattle), Graham-Kapowsin High School (Graham), Jackson High School (Mill Creek), Lakewood Jazz Choir (Arlington), Lynnwood High School (Bothell), Mercer Island High School, Mountlake Terrace High School, Newport High School (Bellevue), Roosevelt High School (Seattle), Seattle JazzED, South Whidbey High School, and W.F. West High School (Chehalis) will be featured on the CD. This year’s professional jazz mentors include Thomas Marriott, Tracy Knoop, Greta Matassa, Brad Boal, Jay Thomas, Travis Ranney, Dan Wager, Steve Treseler, Neil Welch and Andy Omdahl. The School of Jazz project has won has won two national awards for its effort. On May 7th during KPLU’s Midday Jazz, KPLU will broadcast the entire CD (one song every 30-minutes) between 9am – 3pm PST. Listeners can hear it locally in the Seattle/Tacoma market on 88.5 FM, or online at kplu.org. SFJAZZ Center has had a very exciting opening season, but no show will likely be more creative than the program that pianist Jason Moran has put together. Moran will be performing with his Bandwagon combo, which includes Tarus Mateen on bass and Nasheet Waits on drums, while “a who’s-who of Bay Area skating luminaries who will take flight on a specially constructed skating half-pipe installed in front of the SFJAZZ Center stage.” Skaters include Adrian Williams, Alex Wolslagel, Dave Abair, Jake Johnson, Ben Gore, Justin Gastelum, Billy Roper and Brian Downey. Jason Moran has been the recipient of numerous awards and honors, including a MacArthur “Genius” Fellowship in 2010. Jazz Journalists Association ‘Jazz Heroes’ are activists, advocates, altruists, aiders and abettors of jazz who have had significant impact in their local communities. The ‘Jazz Hero’ awards, made on the basis of nominations from community members, are presented in conjunction with the Jazz Journalists Association’s annual Jazz Awards honoring significant achievements in jazz music and journalism. Seattle’s Julian Priester is one of 25 Jazz Heroes designated by the Jazz Journalists Association to celebrate those who have had a significant impact on their jazz communities. There will be a Jazz Hero award presentation for Julian Priester at Tula’s at 6 PM PST on Tuesday, April 30, International Jazz Day. Trombonist Julian Priester, also known as Pepo Mtoto (“Spirit Child”), has from the very beginning of his musical career demonstrated Zen-like equanimity when presented with conflicts or opposites. Growing up in a South Side of Chicago neighborhood with the hard rocking blues of Muddy Waters and Bo Diddley in his head but high school band disciplinarian Captain Walter Dyett instructing him in something very different may have had something to do with it. Or maybe it is just his calm personality, his ability to listen and absorb, and the subtlety of his expressivity, characteristics evident in his own music of the past nearly 60 years, from his first jobs in Sun Ra’s Arkestra through his retirement last year from the faculty of Cornish College of the Arts in Seattle. In November 2011, the United Nations Educational, Scientific and Cultural Organization (UNESCO) officially designated April 30 as International Jazz Day in order to highlight jazz and its diplomatic role of uniting people in all corners of the globe. 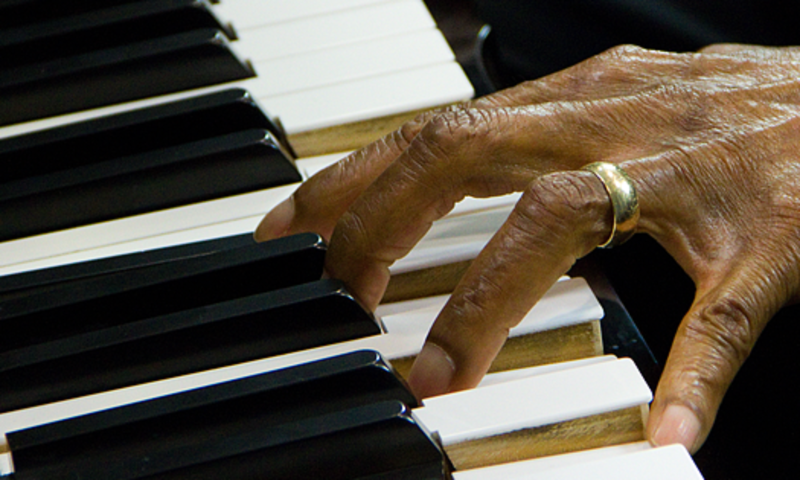 International Jazz Day is chaired and led by Irina Bokova, UNESCO Director General, and legendary jazz pianist and composer Herbie Hancock, who serves as a UNESCO Ambassador for Intercultural Dialogue and Chairman of the Thelonious Monk Institute of Jazz. The Institute is the lead nonprofit organization charged with planning, promoting and producing this annual celebration, which began in 2012.
International Jazz Day brings together communities, schools, artists, historians, academics, and jazz enthusiasts all over the world to celebrate and learn about jazz and its roots, future and impact; raise awareness of the need for intercultural dialogue and mutual understanding; and reinforce international cooperation and communication. Each year on April 30, this international art form is recognized for promoting peace, dialogue among cultures, diversity, and respect for human rights and human dignity, eradicating discrimination, promoting freedom of expression, fostering gender equality, and reinforcing the role of youth for social change. International Jazz Day is the culmination of Jazz Appreciation Month which draws public attention to jazz and its extraordinary heritage in April. UNESCO and United Nations missions, U.S. embassies and government outposts around the world hosted special events for the first annual International Jazz Day on April 30, 2012 to honor this revered musical art form. Universities, libraries, schools, community centers, performing arts venues and arts organizations of all disciplines around the world marked the day through concerts, education programs, seminars, lectures, book readings, public jam sessions, master classes, photo exhibitions, dance recitals, film and documentary screenings, theater presentations and spoken word performances. More than one billion people around the world were reached through 2012 International Jazz Day programs and media coverage. In 2012, UNESCO and the Thelonious Monk Institute of Jazz presented three high-profile programs: a daylong celebration in Paris at UNESCO world headquarters; a sunrise concert in New Orleans’ Congo Square, the birthplace of jazz; and a sunset concert at the United Nations General Assembly Hall in New York City. Among the world-renowned artists that participated were John Beasley, Tony Bennett, George Benson, Terence Blanchard, Richard Bona (Cameroon), Dee Dee Bridgewater, Candido, Teri Lyne Carrington, Ron Carter, Robert Cray, Jack DeJohnette, George Duke, Sheila E., Herbie Hancock, Antonio Hart, Jimmy Heath, Hiromi (Japan), Zakir Hussain (India), Chaka Khan, Angelique Kidjo (Benin), Lang Lang (China), Joe Lovano, Romero Lubambo (Brazil), Shankar Mahadevan (India), Ellis Marsalis, Wynton Marsalis, Hugh Masekela (South Africa), Christian McBride, Marcus Miller, Danilo Pérez (Panama), Wayne Shorter, Esperanza Spalding, Treme Brass Band and Stevie Wonder. Hosts included Robert De Niro, Michael Douglas, Morgan Freeman and Quincy Jones. Istanbul, Turkey has been named the 2013 Global Host City for International Jazz Day. The city will host a daylong series of jazz events including workshops and seminars, panels and roundtable discussions, film screenings, student master classes led by prominent musicians and educators, and a major evening performance that will be broadcast on public television stations worldwide. The Institute and UNESCO will continue their partnership to encourage schools, universities, libraries, arts organizations, community centers and other entities in UNESCO’s 195 member states to host jazz concerts and educational programs on International Jazz Day in order to reach people of all ages and backgrounds. This year, celebrations in Istanbul will kick off with a special early morning performance for high school students conducted by Herbie Hancock, Wayne Shorter and others. The evening concert at Istanbul’s famed Hagia Irene will feature performances by stellar musicians from around the world, including pianists John Beasley, George Duke, Robert Glasper, Herbie Hancock, Abdullah Ibrahim, Keiko Matsui and Eddie Palmieri; vocalists Al Jarreau, Milton Nascimento and Dianne Reeves; trumpeters Hugh Masekela, Imer Demirer and Christian Scott; bassists James Genus, Marcus Miller, and Ben Williams; drummers Terri Lyne Carrington and Vinnie Colaiuta; guitarists Bilal Karaman, John McLaughlin, Lee Ritenour and Joe Louis Walker; saxophonists Dale Barlow, Igor Butman, Jimmy Heath, Wayne Shorter and Liu Yuan; clarinetists Anat Cohen and Hüsnü Şenlendirici; violinist Jean-Luc Ponty; Pedro Martinez on percussion and other special guests to be announced in the weeks ahead. John Beasley will be the event’s musical director. The events will be streamed live. If you are holding an event for International Jazz Day, you can register it on the International Jazz Day website by clicking here. You can watch a Live Webcast of the International Jazz Day Global Concert, from Istanbul, Turkey on YouTube. The Webcast begins at 9pm (Istanbul) / 7pm (London) / 2pm (New York) / 4am (Sydney – May 1st). Below is the video of the concert from last year.